Get Creative with Your Deck – New Jersey Siding & Windows, Inc.
No matter its shape or style, a well-designed deck should feel more like an extension of your home’s indoor space than a backyard accessory. Decks are a place for gathering friends and family, but designing and decorating them for these kinds of events can be a challenge. Whether you’d like to install a new deck or improve your existing one, New Jersey Siding & Windows, Inc. recommends checking out these four deck design ideas. When configuring the design of your deck, it’s important to consider the access points to your yard. Whether your deck is elevated or low to the ground, utilizing wide, shallow steps will give the space an open feeling. For greater accessibility to the outdoors, you may consider integrating a ramp into your plans. 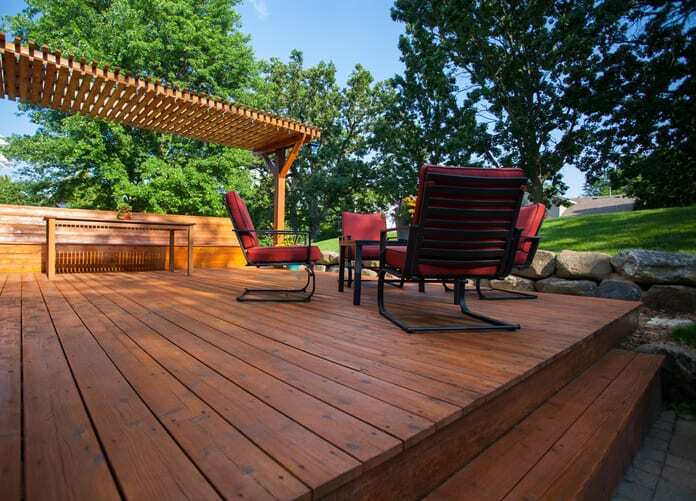 Your deck’s material can dictate everything from overall style to functionality. You’ll want to find an option that complements your home’s aesthetic without compromising on the build integrity. Materials like composite and PVC decking provide the classic look of wood in a variety of colors to complement your home, but require minimal maintenance over the years and resist the cracking, swelling and warping that cause wood decks to deteriorate over time. From spacious umbrellas to outdoor canvases, finding the right coverage for your deck helps you enjoy the outdoors on rainy days. Attaching a porch enclosure to your deck flooring can prevent pesky insects from entering your space, while adding a pergola helps shelter the area from intense sunlight and poor weather. Not only are railings recommended for safety, but they also prevent your personal items from blowing away in harsh winds. Many of these coverage options double as a layer between you and nearby neighbors, so you can bring the privacy of indoor spaces into the outdoors. Furnishing your deck with comfortable chairs, stylish rugs and sturdy tables can lend a whole new dimension to your outdoor space. Well-chosen deck furniture creates a cohesive look from the inside of your house to the outside, and comfortable couches and outdoor-friendly pillows are a must for entertaining. A widely disbursed arrangement facilitates interactions during large events, while placing tables and chairs closer together creates a more intimate atmosphere. When your home is ready for new decking, the team at New Jersey Siding & Windows, Inc. is here to help you at every step. As a family-owned and -operated business, we have served Northern New Jersey with high-quality decks for years. Call us at 973-895-1113 to schedule a no-obligation estimate with one of our friendly specialists today.